This week’s school bus crash in Chattanooga, Tennessee, which has killed at least 5 elementary school children and left another 6 in the hospital, has raised troubling questions about the use of public tax dollars to pay privatized school bus company.The company responsible for the accident, Durham School Services, has long been accused of cutting corners on safety and intimidating those who try to speak out. Durham is the second largest private school busing company in the U.S. with over 17,000 vehicles transporting over a million students to school each day. However, despite their size, parents and school bus drivers have long complained that the company ignores safety complaints in their quest for profits; many of them predicting that the company’s desire to cut corners in their quest for profits would lead to a tragedy. Indeed, in 2015, two members of the British House of Commons traveled to Tennessee to investigate the safety and labor record of Durham, which is owned by the British parent company National Express Company. The MP’s said they found that Durham’s record of worker intimidation and low wages lead to unsafe working conditions at the company. “A lot of them are frightened to come forward in case of intimidation, in case of losing their jobs, in case of being given less hours,” British MP Jim Lavery told WMC-TV in 2015. Many of the workers told the MP’s that the low pay and erratic hours made it difficult for Durham to retain and train qualified drivers. 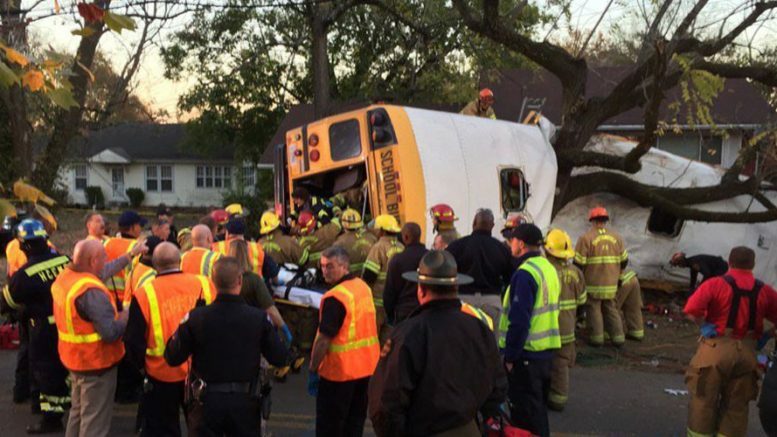 A concern, which has been echoed by members of the Chattanooga community, following the deadly bus accident Monday, which resulted in the deaths of 5 elementary school aged children. According to the Tennessee Department of Safety, the 24 year old school bus driver Jonhthony Walker had his license suspended in 2014 for failing to provide insurance following a crash. Then in September, Walker was involved in another crash after running a stop sign and colliding with a Kia Soul. Many parents of the students in the deadly accident in Chattanooga said that their complaints about Walker’s driving were ignored by the company and the Hamilton County school district. Durham though has long been labeled as one of the worst school bus providers by organized labor; even winning induction into the Oregon School Employees Association’s “Outsourcing Hall of Shame” for their poor safety record and low wages. In 2013, the city of Beaufort, South Carolina voted to stop using private contractors all together for school transportation after Teamsters members blew the whistle on the Durham’s unsafe working practices. Many drivers say that the lack of training for school bus drivers employed by Durham and the low pay that makes it difficult to attract more skilled drivers. According to the wage tracking site GlassDoor.com, Durham School Services pays bus drivers on average only $14.92 an hour with many bus drivers being forced to take seasonal jobs, when school is out of session. Indeed, Genevere Walker, the mother of Jonnthony Walker, told CNN that her son was forced to work two jobs in order to make ends meet. Workers at Durham have long complained that the company retaliates against those who choose to complain about their safety practices. Indeed, Durham School Services has been formally cited in 57 formal complaints by the National Labor Relations Board between 2001-2013 for anti-union activity according to an analysis performed by the Teamsters. Most recently, in June of 2016, the NLRB ordered Durham to recognize a union of school bus drivers in Santa Rosa after Durham had refused to bargain with the federally-certified union for over three years. In addition to being cited for illegal anti-union activities, Durham School Services has been found guilty in a number of high profile wage theft complaints. In 2011, a California court ordered Durham to pay $7 million in back pay to 3,000 school bus drivers for wrongfully denying them overtime pay. Then again in 2014, a federal court ordered Durham to pay 350 Maryland school bus drivers a whopping $1.25 million for failing to pay them overtime pay. On Wednesday, a bipartisan group of Tennessee state legislators called for the passage of a bill to require all school buses to provide students with seat belts. However, so far, both political parties have been mum on taking action regarding low pay, privatization, and illegal union busting at Durham School Services. 1 Comment on "Deadly Chattanooga School Bus Company Has Long History of Worker Intimidation & Safety Violations"
The school district should have chosen a school bus company a lot more carefully. If anytime a school bus company has had a record of serious violations, then the school district should select a different company at once. It isn’t worth risking children’s lives to save money. Once a company is chosen, the school district should keep an eye on the company’s performance when it comes to safety. If there are repeated safety issues, the company can be put on notice by the school district to straighten themselves out or the contract with the company will be terminated.